Nodland Construction will handle all of your street construction needs from subgrade preparation to installation of sand and class 5. We will install any sanitary, storm sewer, or watermain required to complete your project. Nodland Construction will value engineer projects to save the owner money and complete projects more quickly. Our company offers excavation in ways to meet all your grading needs. 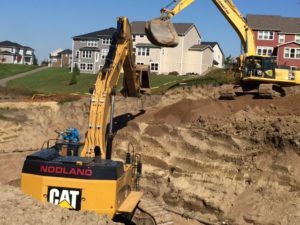 Nodland Construction offers crews with the best and newest equipment with the latest technology from Caterpillar and Komatsu. Nodland Construction is a fourth-generation business with experienced employees that value our customers. Fully integrated office and field communications.